The only app to schedule written text messages for messengers. 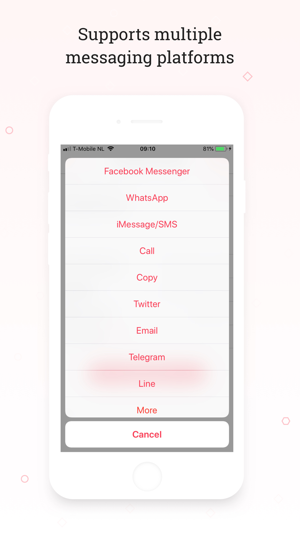 We support: iMessage/SMS (with Auto Send), Email (with Auto Send) Facebook Messenger, Line, Whatsapp, Telegram, Twitter, Slack, WeChat, LinkedIn, Skype and Phone. Be a better friend or a better business with Scheduled. Be a better friend. Never forget to stay in touch with people that matter to you. Think of anyone who deserves a kind note, heartfelt birthday wish, or wishing somebody good luck with their driving test. Be a better business. Scheduled for Business helps you to be a better business by sending prewritten messages to your clients, staff or network automatically. 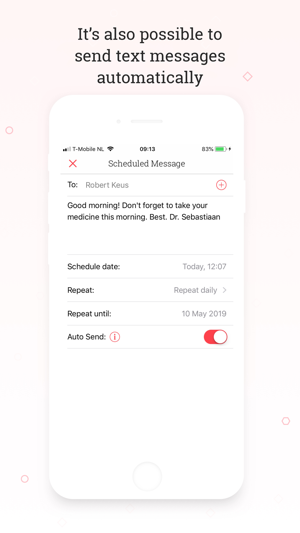 You can schedule and (auto)send appointment reminders, meeting reminders or other messages to individuals as well as groups. Reduce no-shows and keep your network or staff informed in an easy and personal way. 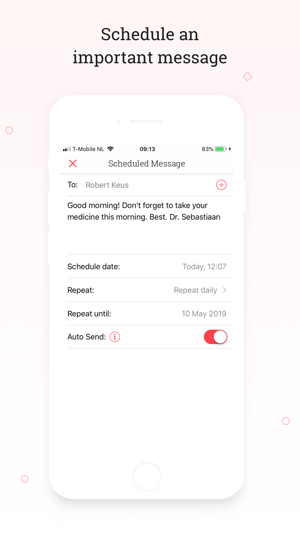 Step 5: Send your message with Messages/SMS, WhatsApp, Facebook Messenger, Telegram, Slack, GroupMe, Skype, LinkedIn Line, Twitter, Phone and many more. - Message Suggestions. 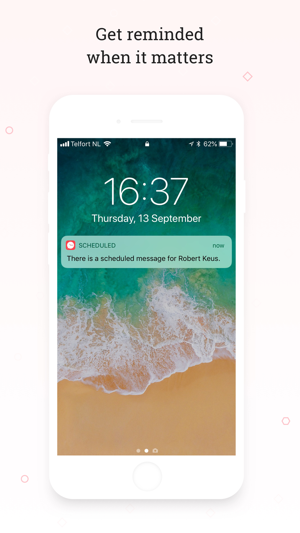 Once you’ve connected your calendars, Scheduled can help you schedule messages. It registers your events and gives you suggestions for important messages each week. The Scheduled app is free to use and download. We also have Premium and Business subscriptions that offer exclusive features, priced from $1,99 monthly to $4.99 monthly. Subscriptions will automatically renew each month and be charged to your iTunes account within 24-hours of the end of the current period, unless auto-renew is turned off at least 24-hours before the end of the current period. You can turn off auto-renew at any time from your iTunes account settings, but refunds will not be provided for any unused portion of the term. These prices are for United States customers. Pricing in other countries may vary and actual charges may be converted to your local currency depending on the country of residence. If you encounter any issues or require support, please email us at support@scheduledapp.co. Or want to help us translate Scheduled to your language? Add or edit your language here: https://poeditor.com/join/project/HUr4cIIHbo or email us at translate@scheduledapp.co. If scheduling itself is not available for users for free then it's pointless to name it as a scheduler app. Kindly remove the app from free category and put it under paid apps with default scheduling enabled.